During a recent site visit for our BOOST initiative, the group we observed was reading “Writing My Wrongs” by Shaka Senghor. So I decided to read it, too. 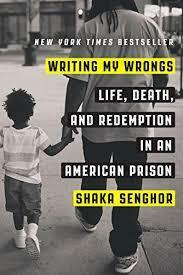 The author, Shaka Senghor, was born on Detroit’s east side, in a middleclass neighborhood, during the height of the 1980’s crack epidemic. Shaka’s life started out on a promising note. He was a straight ‘A’ student and a good all-around kid. Then at age 11 his mother and father separated. He and his two younger sisters lived with their mother, although his father promised he would always be there for him no matter what. Over the next several years, his parents got back together and separated multiple times finally getting divorced. Each time they separated, Shaka’s attitude towards life got worse, until he did not care about anything. At age 14, Shaka was tired of his circumstances and the beatings from his mother. So he ran away from home and turned to the streets. For the next five years, in order to survive, he started dealing drugs and turned to alcohol and guns. At age 19, he murdered a man and was sent to prison. While in and out of county correctional facilities, he learned that jail was not much different from the streets: Both places were power-based environments where the only means of gaining respect were violence and money. After being in solitary confinement -- better known as the “hole” -- off and on for seven years, Shaka realized the anger and pain he was feeling was a destructive force that was tearing him apart, and he knew he had to find a way to change. He started reading and putting his thoughts down on paper, and this process of self-examination began to change him. He would read the Bible or other religious books from the prison’s library. For seven years in the “hole,” he tested his will to survive. He also began to truly grow and forgive the people who had hurt him, and prayed for forgiveness from the people he had hurt in so many ways. After three meetings with the parole board and many disappointments, Shaka was released from prison at the age of 38. For the first couple months at home, he reconnected with his family and got his first ever driver’s license. His surroundings had really changed since going to prison, and it was a lot for him to take in. He volunteered with youth in the community, sold some of the books he had written while in prison, and had numerous speaking engagements at local high schools, mentoring young men and women who were starting down the path he had taken as a young boy. Sharing his story with the community eventually led him to a fellowship at the MIT Media Lab and the Kellogg Foundation. Shaka Senghor is a writer, mentor, and motivational speaker whose story of redemption has inspired thousands. It certainly inspired me.